The first half of the 1920s proved a tumultuous time for the Homestead Hebrew Congregation Rodef Sholom (HHCRS). Efforts to keep the synagogue modern and relevant clashed with long-standing power struggles, producing a tragedy of such magnitude that the synagogue omitted it from both its contemporary records and subsequent histories, and who could blame them? It makes me sick and guilty to think about it even ninety years later. Rev. Samuel Widom was an immigrant from Russia. He began at HHCRS in August 1906 when he was in his mid-30s, probably just a couple years after arriving in the U.S. After two years Widom was able to bring over his wife and three children. In 1920, when this story begins, he was almost fifty and the father of three girls and two boys ranging in age from seven to twenty-one. Reading through the synagogue’s history, one does not get the sense that his bosses, the synagogue’s leadership, were easy people to deal with, but he had persevered for fourteen years already. 1 According to one of the oral histories from 1993, he was a “very old fashioned rabbi,” though another recalled him as a “very, very popular rabbi.” The whole of this story lies between these two assessments. Communication from M. D. Weiss and Samuel Rosenthal, President and Secretary respectively of the Homestead Hebrew School Association, requesting the moral help of the Cong. and enlisting their aid in trying to stop private teaching was accepted and filed. Motion by Bro. I. Grossman, seconded by Bro. J. Burechson to the affect (sic) that a communication be sent Rabbi Samuel Widom demanded that he cease and give up the private school is now conducting, and that, if this is not complied with, by the next meeting his contract with the H.H.C.R.S. will be declared null and void. From the oral histories, it’s clear that other men taught privately, too, but Widom was within their power as an employee. Did he actually violate his contract, or merely his general obligation to support all the synagogue’s institutions (the school attendance having always been a challenge to maintain)? Report received that Rev. Widom has promised that under no consideration will he conduct a private school or undertake to give private lesson in Hebrew. This ad, from the same time period as these events, give a sense of the range of activities rabbis were then expected to perform. For all of his time at HHCRS thus far, Widom was the only clergyman, but what sort of clergyman they considered him seems to have evolved over time. Widom perhaps began as a full-fledged rabbi, the congregation’s spiritual leader, but the synagogue’s meeting minutes covering his first fourteen years do not survive for us to know. We must start in 1920, in media res, at a time when the synagogue’s officers seemed increasingly reluctant to consider him their leader, alternately calling him “Rev. Widom” and “Mr. Widom” and referring to his position as chazan-shochet-teacher (cantor, kosher butcher, teacher) or just cantor. It seems they didn’t consider him their true rabbi, if ever they did. Perhaps they thought he was too antiquated and was now holding back the synagogue. Perhaps he wasn’t able to give sermons in English, a common shortcoming for rabbis in those days, and an increasing problem as the first generation of native-born children then came of age (children born when the synagogue was founded would have been in their mid-twenties at that time). Or most likely, aspects of all of these possibilities and more meant he simply couldn’t be as modern as they wanted their leader to be. Perhaps they simply thought they had outgrown Widom. It was around this time that they began to fear that assimilation was leading the next generation away from the synagogue, so they urgently feared the consequences for the future of their families and community if they could not find an inspiring, modern leader. 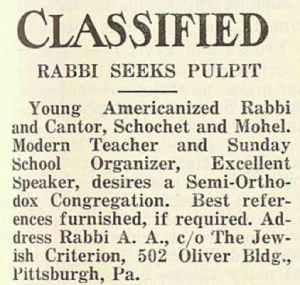 So, by 1920 the congregation had already been searching for a new rabbi for some time, and given their budget — twice Widom’s salary — it wasn’t to get him a helper. They were looking for a true star to elevate all the synagogue’s activities, and even if they had meant only to demote, not oust, Widom, it was clear they did not see potential in Widom. They wanted a fresh face at the helm of their congregation. For an organization whose speeches trumpeted achdut, unity, and achava, brotherhood, at every turn, their actual operations were characterized by anything but. From the beginning the Homestead Jewish community had been split between Russians and Hungarians, and they vied for control of the shul. However the infighting had expressed itself before, it focused now on who would shape the spiritual destiny of their community. And this older, Russian man, who had been found wanting despite fourteen years of loyal service, was caught in the middle. 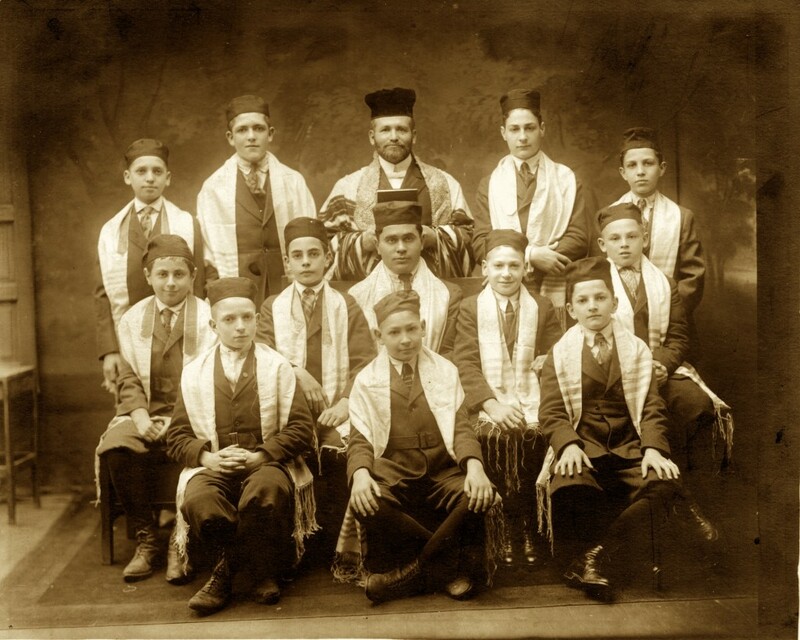 Rabbi Widom, in the dark hat, with students who include his two sons, c. 1924. Meeting was called for the purpose of electing a Rabi (sic) for the H.H.C.R.S. The president explained the purpose of the meeting and every Brother present was asked to express his opinion freely. After the question was thoroughly discussed the question asked was, are there any applicants for the portion? An application of Rev. Mayer Winkler was read and said that he was a candidate for the position. On motion and seconded the application was accepted and ordered filed. A motion made and seconded that the said (Mr.) Rabi Mayer Winkler should be elected Rabi of the H.H.C.R.S. for one year, with a salary of ($600) six hundred dollars, payable at the rate of ($50) fifty dollars per month. After several remarks a vote on the question was called. The motion unanimously carried. The Sect. was requested to notify Rev. Mayer Winkler of same. As always, the minutes conceal a lot, but in this case there are facts that can be recovered from the larger historical record to put these events into context. First, it’s important to know who this Rabbi Winkler was. “Undoubtedly one of the most eminent men of Hungary,” he had been educated in prestigious religious and secular institutions and was lately rabbi for nine years at the largest synagogue in Budapest (The Jewish Criterion, 5/13/1921, p. 16). He was a star by anyone’s standards, and a man like that doesn’t just apply for a job in a small-town across the ocean and await the congregants to vote him in or not. His plans, in fact, are well-established: “Dr. Winkler’s primary idea in coming to the United States was to get command of the English language,” continues the same newspaper article. “He will take up a course in the University of Pittsburgh.” Finally, note that the article reveals that he has already been “in this country a few days.” Given how long the journey from Hungary would take, let alone the kind of planning that would accommodate for a wife and three children, clearly his hiring had to have been in the works for some time. The meeting was a formality for a decision that had already been made outside of the congregation’s usual processes. Undoubtedly, it was a major coup for the synagogue. In addition to the article in Pittsburgh’s Jewish newspaper quoted above, Winkler was front-page news in Homestead’s newspaper the very morning after his election. A glowing column about how “the local congregation is to be congratulated on receiving his services” even featured his photograph, a rare occurrence (The Messenger, 5/5/1921). This article, too, required pre-planning. One of the men who read this article the next morning was surely Widom. He saw that the man who would displace him after his fourteen and a half years of service was ten years younger and outshone him in credentials and connections. But Widom’s years of service were not for nothing. Remember from the oral history, he was “a very, very popular rabbi at the time,” and eighteen days after the first special meeting, a second special meeting was called, most unusual. On petition of several members of the HHCRS a special meeting was called by Bro Pres A Weiss. The meeting was called and held as requested. The question for the meeting was that on Wednesday, May 25, 1921, would be the 25th Wedding Anniversary of Rev. S. Widom and Wife and in appreciation of his long and faithful service, for the Congregation it would be nothing but right and just to give them some token of appreciation. A motion was made and seconded that a committee of three be appointed to purchase a present the same to cost up to ($100) one hundred dollars, carried. What happened suggests to me that some in the congregation felt they needed to redress an injury. As before, one can only imagine what took place behind-the-scenes for Widom’s allies to alight upon this particular conciliatory gesture and enact it in such an unusual way. They wanted him to know that although they had found their star, he still mattered to them. I might have thought that the hiring of the world-famous Winkler would have put the in-fighting to rest — who could object to such a man? — but whether it was the manner in which he was sprung on the congregation or the unexpected groundswell of support for Widom, it seems both factions were anxious to shore up their numbers, because at the end of the special meeting, the synagogue opened its charter for new members to join. In a frenzy many new members were proposed, and the by-laws were suspended to accept them by a congregational vote without the usual requirement of a background investigation. After Winkler’s arrival, it’s unclear how Widom and Winkler worked together. The only mention in the minutes is that they were both on the kashrut committee. Widom retained his salary of $125/month, if not his former job or prestige, though Winkler, who began at $50/month, was clearly in charge. Winkler made a splash almost immediately; I wince to think of Widom, who had been deeply involved with the school, reading this article only three months after Winkler’s election, even before the installation ceremony and banquet. Homestead Jewry is manifesting keen interest in Rodeph Shalom Congregational activities since the arrival there of Rabbi Winkler. 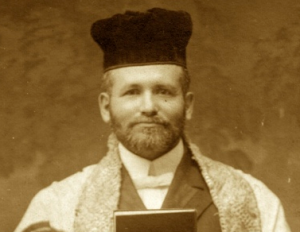 The growing success of the Talmud Torah is due to the untiring efforts of Rabbi Winkler, who has increased the enrollment from twenty-five to seventy-five children (The Jewish Criterion, 8/5/1921, p. 23). Judging by subsequent newspaper mentions Winkler may have been more active than Widom had been prior, but perhaps it was merely that his activities were deemed more noteworthy, both by a congregation looking for good publicity and a newspaper happy to brag about the luminary in their midst. In November his salary was doubled to $100/month — still less than Widom’s, though. A Delegation from the Ladies Aid Society appeared at the meeting and a beautiful plea was made to those present by Mrs. Celia Hepps appealing to them to re-elect Rev. Dr. Winkler as Rabbi of the Congregation. She was listened to with great attention and were assured by the President that there (sic) wish should be carried out. Mrs. A. Weiss and Mrs. H.S. Schwartz also spoke on the same line. The Meeting was then declared open for election of a Rabbi. Secretary reported that Rev. Winkler was a candidate for the position and if so desired would appear in person. Report accepted…Rev. Mayer Winkler was unanimously elected Rabbi of the H.H.C.R.S. for the term of 1 year. Rev. Winkler appeared before the Congregation and in a few appropriate words thanked the Congregation for re-electing him and promised a great future to the Congregation. Again, if you thought that the latest round of enthusiastic, unanimous support for Winkler would have quelled the factionalism, you’d be wrong. Two months later, the synagogue’s secretary was instructed “to notify Mr. S. Widom that his term of office expires August 1, 1922” and “to send out Postal-Cards for the next meeting with remarks ‘To discuss the nomination of a Chazen and a Shochet'” (June 3, 1922 meeting minutes, p. 34). Viewed in light of what happened next, I think some sensed an opportunity to be rid of Widom entirely now that Winkler had taken hold so strongly. Nothing came of this initiative, however, because by the beginning of August, the synagogue’s fortunes would change dramatically. If it seemed to good to be true that the HHCRS had a world-famous rabbi, it was. Winkler resigned only a few months into his second term to take a much more prestigious position leading a synagogue in LA. Given this unexpected opening, Widom’s supporters sprung into action. At the same meeting where Winkler’s resignation was read and accepted, there was the second frenzied election of the year. At a meeting of the Homestead Hebrew congregation held at the Synagogue, Sunday, August 7th, which was attended by a record-breaking attendance, almost the entire membership being present, the Rev. 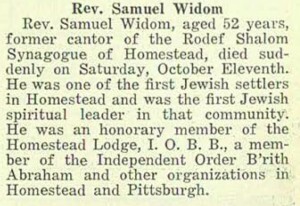 S. Widom was re-elected Cantor for the congregation by a majority unprecedented in the history of the Homestead Jewish community. [Ed: Note his support is not unanimous.] Rev. S. Widom has an enviable record of sixteen years continued service in Homestead and the members of the community showed their appreciation of his faithful and efficient service by turning out in a body to re-elect him for the ensuing term (The Messenger, 8/8/1922, p.1). Whether a face-saving gesture after Winkler’s embarrassingly premature departure, or a genuine outpouring of emotion for someone they needed now more than ever, the vote returned Widom to his former role as HHCRS’ sole clergyman. He had a new, two-year contract to continue as cantor, but his salary was reduced from the $125/mo. he had been receiving to the $100/mo. Winkler had received. There’s very little to go on to know how Widom endured the roller-coaster of those few months — from almost-termination to re-election by default with a salary cut. And during the next two years he appears very little in the synagogue minutes. Also absent from the minutes is any further jockeying by Widom’s detractors, who likely appreciated the need for things to re-stabilize, let alone any acknowledgement whatsoever of a senior rabbi vacancy. Politics may have been set aside temporarily, but the same few mentions of Widom also hint that things were not right with him during this period. A motion made by Bro. Mark Fishel and seconded by Bro. Jos. Freed, to notify Chazen Widom, that if he does not attend to his duties his contract will be declared forfeited. Rev. S. Widom given permission to take two weeks vacation but that he must furnish a Shochet to kill chickens. A motion made by Bro. Kardon seconded by Bro. M. Margolis that the Cong. should give Hazen Widom and teacher Jos. Witner a present of 75.00 and 50.00 respectively. Carried. In light of what happened next, it’s hard not to read more into these few mentions. Something had come undone. Perhaps Widom already suspected his position was tenuous, and perhaps he wanted to know sooner rather than later how badly things might go for him. Whatever the reasons, starting at least 2.5 months before his contract expired, he reached out to the shul. The reaction to his opening move was startling. Communications from Rev. S. Widom in regards to his position was lengthy (sic) debated and on a motion by Bro. Joe Freed and seconded by Bro. M. Fishel that a Committee be appointed to work out Ways and Means for the betterment of Homestead Jewry. Committee to consist of Bros. M. Grinberg, M.D. Weiss, Joe Freed, H. Glick, B. Friedlander, B. Hepps, R. Shermer. The Chairman [M. Grinberg, a Russian] explained the purpose of the meeting as follows: The time has come in the life of the Jews of Homestead when we must make some changes in the religious life, if we wish to take care that our young men and women are not to be lost to Yuda. Eventually they got to the crucial issue of synagogue leadership. Concerning the retention of Mr. Widom, the committee could not agree on anything definite, so they refer the matter back to the congregation with but the recommendation that they engage a Rabbi of modern Jewish tendencies. While control of the synagogue was being consolidated into the hands of the few, something happened to Widom. The records show that they stopped paying him at the beginning of August. Only after the new leadership was in place came this brief acknowledgement, “Chairman B. Hepps, points out that we have a vacancy, for Chosen Shochet teacher and Rabbi” with no explanation for why (p. 84). There is no indication how the synagogue responded to Widom’s communications about his position, if at all, but he would have quickly recognized that the change in power was not in his favor, and his base of support in the congregation no longer had voting rights. Coincidentally — or not — ten days later a long, laudatory article about Rabbi Winkler’s growing national prestige appeared in the The Jewish Criterion. Whatever had happened to Widom, this article could not have helped his emotional state any. Mr B. Hepps rules this motion out of order. Mr. B. Hepps ruled that, as this meeting was called by petition for a specific purpose [to discuss Rev. Decter] the reading of the previous meeting’s minutes is out of order. Mr. Charles W. Frankel asked the Sec’y if he has the minute book at the meeting, the answer was given in the negative. Mr. Charles W. Frankel moved to adjourn until the Sec’y will produce the minute book. Mr. B Hepps concurred and the meeting was adjourned. And where was Widom during all of this? The next meeting of the new Board of Directors was 10/9, the day after Yom Kippur. There is some discussion around a candidate for the “Chasen Shochet Teacher” position. There is no mention of Widom. The next meeting of the new Board of Directors was 11/4. From the minutes, everything sounded so normal. “B. Hepps opened the meeting in regular form. Property Com. report everything in good order…Mr. Z. Smoke (sic) asked permission to have a wedding ceremony performed in the Synagogue…A motion made to allow Music at wedding was carried. A motion to allow dancing, was lost.” There is more discussion about looking for a rabbi as well as a permanent “Shochet, Chasen.” The only sign that something is seriously amiss is the decision “to hold meetings every Thursday of each week at 8 PM.” Again, there is no mention of Widom. And so on and so on for the next many months. But something happened two days after the 10/9 meeting that the 11/4 meeting and all the official records thereafter refused to acknowledge. Rabbi Samuel Widom killed himself. The synagogue’s minutes and the newspaper articles reflect the synagogue leadership’s choices in what was reported and how. For a more unvarnished take, we must turn to the oral histories taken in the early 1990s. 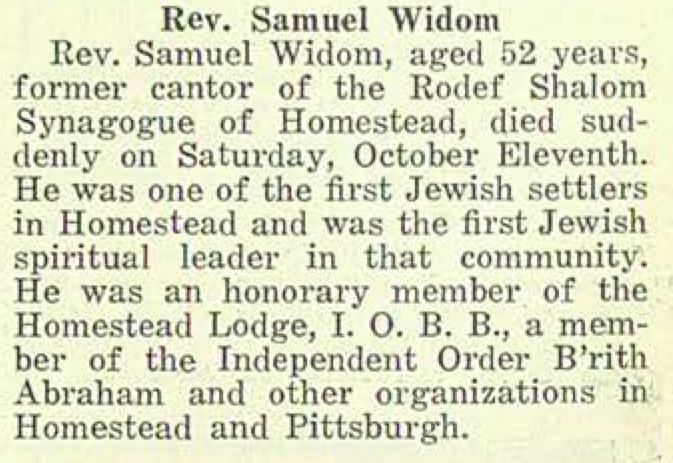 HH: Rabbi Widom was a very, very popular rabbi at the time, except Rabbi Widom did a terrible thing… He hung himself in a synagogue….And he’s buried on the Homestead cemetery, but at that time what was near the fence (they may have moved the fence). Yeah. But it was a great disgrace. Nobody knows why he hung himself — in the synagogue! HH: Yeah, in the synagogue. Hung himself off of one of the, one of the chandeliers or wall hanging brackets or something. AP: So that was quite a scandal for the synagogue. Did he have a family? HH: Yeah, he had a family. AP: And I take it they didn’t stay in the community. HH: No, no. But he was a respected rabbi; it could have been who married my parents. AP: Were there factions? Were the Hungarians a separate faction? JC: Well, in shul, it wasn’t that bad. They used to fight for control of the shul and stuff like that, I don’t know, it was more symbolic than anything else. I, you know, I don’t know whether you want to know about that bad parts of the shul. AP: Of course, that’s part of what it’s all about. JC: Did anybody tell you about the rabbi that committed suicide? JC: Rabbi Widom? You know he was a very old fashioned rabbi. He was the one who taught me my maftir for the bar mitzvah, and there was a faction that wanted to replace him. They fired him, and he committed suicide. I think he took poison, I don’t know if he jumped off the bridge or not. JC: And then they had the — it was a terrible feeling — and then Rabbi Ashinsky came from Pittsburgh. He was a leading rabbi. Did you ever hear of him? AP: …You were talking about Rabbi Ashinsky’s coming. JC: Yeah, as I say, I mean, that caused a lot of bad feeling among the people. It’s funny that these people who said they were so religious would do something like that. Widom’s death certificate says that he drank carbolic acid (a common means of suicide at that time) and died at 3:23 AM on Shabbat, three days after Yom Kippur and two days before Sukkot. 7 Though Jewish law says suicides are not entitled to Jewish burial or mourning rites, he was buried within twenty-four hours, though near the fence, with a proper service that was performed by the shammes. Sukkot began that evening, and though Jews are commanded to rejoice during this holiday, it’s hard to begin to even guess at what the mood would have been in shul. In their next meeting a month later the board did not pause for a minute of silence as they typically did when synagogue members or presidents of the U.S. died. A leading member of the congregation, Ben Friedlander, covered his funeral expenses, and I have to assume they all worked to keep Widom’s suicide out of the papers. 8 Homestead was a town of many suicides — I happened across a number on the front-page of its newspaper, and a history of the town confirmed my suspicions 9 — and it would have been a sensational story if the press had gotten hold of it. Was what happened to Widom the community’s original sin coming home to roost, as JC would have it, or just the personal tragedy of a man in decline? Though these events have had a few months to settle in my mind, the discovery has gutted me in a way I hadn’t experienced before. I am researching Homestead in such detail — and you are reading my findings — because we have such warm feelings for our ancestral community. A singular event shouldn’t change how we view it… or is this event that singular? Widom’s family remained in Homestead for at least another year, but by 1930 they were across the river in Squirrel Hill. In December 1925 a letter arrived from Mrs. L.A. Metz of Youngstown, OH (Update 3/18/2016: Mrs. Metz is one of R. Widom’s daughters), requesting, “that the family of the deceased Rev. Sam. Widom, be permitted to place a bronze Memorial tablet in the Synagogue so that his memory be perpetuated to the Homestead people” (p. 133). The committee appointed to decide the matter never reported back. In May 1926 another committee was formed “to procure a monument for the grave of Rev. Samuel Widom” (p. 155). They were successful in raising the money and erecting the stone. In Jan. 1927 Mrs. Widom asked permission to purchase the lot adjoining her husband’s, which she was permitted to do (p. 178). At some point she was named an honorary member of the shul. She outlived her husband by almost 20 years. Two of their children were also buried near them in the Homestead Cemetery. The shul had their next rabbi by the end of the year of Widom’s death, a Rev. Benjamin N. Goldberg, whom they elected in December for a term of three years. They certainly got their comeuppance with him! Four months after starting he asked for his first raise, and the remainder of his tenure featured repeated requests for raises, salary advances, and new contract terms ’til he quit three months before his term was up and then sued them for money owed. Perhaps they learned too late the virtues of a faithful, if unremarkable rabbi. This post covers November 7, 1920–October 11, 1924.